JPNEWT (J. Pechauer)Tour Stop #2 took place the weekend of April 30, 2016 at Markley Billiards in Norristown, PA. If you didn’t show up or tune in via the live stream, then you missed quite the display of talent in the billiards realm. The Irish Invader, Karen Corr, conquered yet another field of tenacious contenders who were striving to reach the mountain top and take first place. This event was an NAPT Pro Event qualifier, meaning the highest placing qualified player will receive a paid entry into the NAPT event to be held the first weekend in June, at Breakers Sky Lounge in Herndon, VA. This tour stop drew 24 entrants and had $800 added by Markley Billiards. As if there was any doubt, Karen Corr almost effortlessly made a beeline to the hot seat, defeating opponents Carol Clark (7-1), Colleen Shoop (7-4), Linda Shea (7-3), Jia Li (7-2), and Nicole Fleming (7-0). Fleming, who took second place, had an exceptional performance throughout the tournament and achieved what could quite possibly be a personal best for her since joining the tour. She first won a match that went hill-hill against Terri Stovall followed by a victory over Erica Testa (7-3). However, she was sent to the secondary bracket in the following match where Jia Li (who had just defeated Melissa Jenkins [7-1] and Meredith Lynch [7-6]) took the win with a score of 7-4. This led to Li and Corr battling for the hot seat, yielding a score of 7-2 in Corr’s favor. On the one-loss side, Joy McFeaters-Haas holds her own, taking victories over Belinda George and Nicole King, before gracefully bowing out due to a loss to Erica Testa. Meanwhile, Kathy Friend who was sent to the secondary bracket by Erica Testa, takes a victory over Kathleen Lawless (7-2), and moves on to play Kia Sidbury in a match that went double hill and ended in Friend’s favor. Sharon O’Hanlon defeats contenders Nicole Nester (7-2) and Melissa Jenkins (7-3) before her unfortunate draw of Colleen Shoop. Shoop, who was sent to the one-loss side by Karen Corr (7-4), landed in a match with Kathy Friend, who denied her access to continue on to the next round. Friend attempts to claim her fifth match win in a row when she draws Nicole Fleming, but Fleming opposed all forces and took the win (7-3), officially making her the NAPT qualifier. Fleming continues on, only to take out her next opponent, tournament director and former touring professional, Linda Shea (7-3). As a result, Fleming is presented with the opportunity for redemption when matched up with Jia Li once more, and takes advantage of it by winning the match (7-4). The official final showdown took place between Karen Corr and Nicole Fleming, rendering Karen a winning score of 7-0. Though Fleming offered excellent efforts to claim the victory, the Irish Invader was bulletproof and maintained exemplary focus in order to claim the title. The Tour wishes to thank Russ Urffer, room owner of Markley Billiards, for his and his staff’s hospitality and hosting this wonderful event. 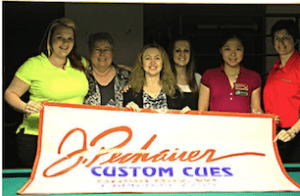 Also, greatly appreciated is the continued support of the Tour sponsors: J.Pechauer Custom Cues, Coins of the Realm, and Britanya Rapp.